There’s no Z in team. “My parents only let us watch old movies,” says Ash, as we’re rummaging through an abandoned pharmacy, looking for medication for our sick friends. “I didn’t even realise they were old, I was so mad at them when I found out Judy Garland was already dead.” It’s a small little character moment, nothing really to write home about, apart from the fact that Ash is a randomly generated character. Just like pretty much everyone else in State of Decay 2. One of the things that makes State of Decay stand out is that you’re not playing as a person, but a community. You collect these survivors as you go along, with most of them squatting in your customisable safehouse. If the character you’re playing as gets tired or injured you switch to another. Each one has randomised quirks and skills, like Demond, an ex shop assistant who loves music and had learned to hot-wire cars during a misspent youth. Procedurally generated characters aren’t anything new, but State of Decay gives them a thick layer of presentation. Every single one of these characters is drawing from what feels like a deep well of fully voiced bits of backstory and comments. Ash’s movies remark, for example, was linked to a quirk which gives her a morale bonus if we somehow manage to scavenge a projector in this blighted hellscape. It’s not a million miles away from Shadow of Mordor’s Nemesis system, but tuned to produce an endless supply of dour survivors in hoodies instead of comedy orcs. You’ll spend most of State of Decay fulfilling these people’s needs, journeying out to collect things like food and medical supplies, or upgrading your base to include things like an infirmary to treat zombie bites. Theoretically it might be possible to build a base that’s entirely self-sustaining, with water and power drawn from nearby buildings and a farm growing food, but in practice this is nearly impossible, forcing you to constantly venture into the wilderness for supplies. The wilderness, of course, is small town America. State of Decay avoids the big urban environments, in favour of small clusters of buildings. There are tons of diners, gas stations and farmhouses, but nothing more than a couple of storeys high. Almost all of these locations contain something, whether it’s a new gun or enough food to get you through the next couple of days, and you’ll methodically clear them out over the course of the game. The map (one of three) is always the same, but dynamic events fire off around it. Sometimes a particular house will become infested with zombies, increasing activity in the area until you clean it out. Sometimes another band will take up residence in a house, trading with you and sending you quests to earn their approval. There are also ‘plague hearts’, nasty lumps of gristle that spawn the infectious variety of zombie, and act like mini-bosses dotted around the map. Kill them all and you’ve pretty much completed a map. All this exploration leads to some very satisfying melee combat, or shooting, if you can spare the ammo. There’s an admirably flat difficulty curve too. 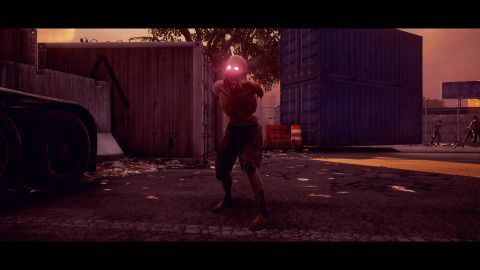 Special zombies like screamers and bloaters can ruin your day in a fair fight, but if you catch them by surprise, a single headshot or stealth takedown can end them. That isn’t to say there isn’t a ton of RPG-style levelling in this game. There are skills to upgrade, ‘standing’ is a kind of experience that gives community wide boosts, and ‘influence’ which is just money. At times I was almost frustrated that I was playing this for review, and couldn’t dive into a world of wikis and guides to figure out if ‘gardening’ was a better skill than ‘pop culture knowledge’ (it is). For a survival game, it can feel oddly safe at times. The game tells me that permadeath is in effect, but in reality I found it surprisingly hard to get myself killed. The one time I got into a truly life or death situation (a comedy of errors involving a horde, an exploding car, and a super powerful ‘feral’ zombie) I was offered enough ‘mash this button to avoid death’ moments to escape with my life. During my playthrough I didn’t lose anyone. To make things easier, I could call on my friends for help. Up to three people can drop into your game at any time, making it very easy for everyone to play at their own pace and only team up when everyone is free. Joining someone else’s game is like a working holiday: you can still improve your skills and earn influence, but you don’t have to babysit your community anymore. It only works if you stick close together, though. Stray too far from each other, and the game will forcibly put you back together. We also noted some sync issues when another player is in the game, with zombies responding to gun damage after a short time delay, which makes it tricky to deal with a horde of them. You can also call on a random player for assistance with matchmaking, but I wasn’t able to test this before release. I was playing State of Decay 2 on a middle of the road PC (Intel i5, 16GB RAM, Nvidia GTX 970). At the recommended graphics setting (high) the framerate hovered around the 55-60 FPS mark. After bumping things up to 'ultra' this dropped to a consistent 30 FPS. I didn't notice any problems like texture pop in and so on, in fact the draw distance was quite impressive. The only major graphical glitch I encountered was a vehicle that flickered between its 'damaged' and 'repaired' state like some kind of ghost truck, and that only happened once. The main bug I encountered in singleplayer was getting stuck on the scenery. There are also issues elsewhere in the game. The first sign of trouble is the ‘get me unstuck’ command on the menu, and sure enough I ended up abandoning two different cars because I got them wedged on the scenery, while a third developed a strange tendency to flicker in and out of existence until repaired. None of these issues were game-breaking for me, but they did mean losing a six-seater armoured truck I’d invested a lot of resources in. It’s worth restating here that State of Decay is fundamentally a game about filling up resource bars, and I can foresee a time when I get bored of that. But the size of the world and the endless characters to encounter keep things fresh, and I’m already planning how to do more efficient playthroughs. Life after the apocalypse can’t go on forever, but it can be fun while it lasts.